Post: Gaurav Akrani. Date: 1/16/2012. Comments (2). Label: Finance. Credit means to borrow something from someone, for example, to borrow money from a bank. Card is a small flat object made of a laminated plastic sheet and other materials. Issued to someone means one is authorized to use a card. Obligation means a moral or legal liability to do something. Remit implies to pay back the money. ISO is an abbreviation of International Organization for Standardization. IEC is an abbreviation of International ElectroTechnical Commission. NBFC is a short-form of Non-Banking Financial Company. ISO/IEC 7810 is an international standard that specifies (sets or defines) physical characteristics like size, thickness, etc. for identification cards. ISO/IEC 7811 is a set of nine standards ranging from 7811-1 to 7811-9. It specifies traditional data recording techniques being used on the magnetic stripe of ID-1 format identification cards. 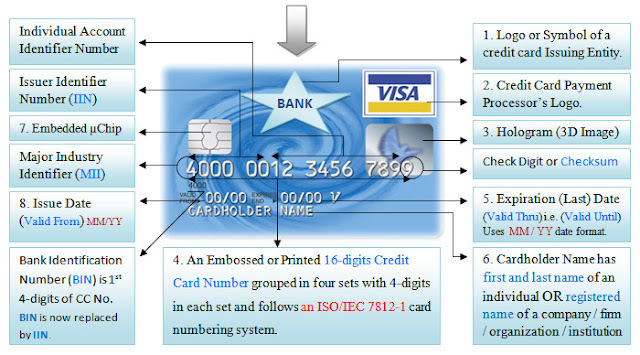 ISO/IEC 7812-1 is an international standard that defines a card numbering system for identification cards. It is used to identify a card issuing entity, like a bank or NBFC. ISO/IEC 7813 is also an international standard that specifies the data structure and data content of Track 1 and Track 2. These tracks are present on the magnetic stripe of an identification card and are used to start (begin or initiate) financial transactions. Embossing is a process in which raised numbers, letters, figures, etc., gets embossed (meaning molded or being craved) on an identification card. Checksum is a single-digit added to the end of a credit card number to check (validate) the authenticity (genuineness) of it. Credit Limit is the maximum amount up to which a lending entity such as a bank or NBFC can give money to its customers. It is of two main types, viz., cash withdrawal limit and credit transaction limit. Cash's withdrawal limit is the maximum amount of money that can be taken out with the help of a credit card. 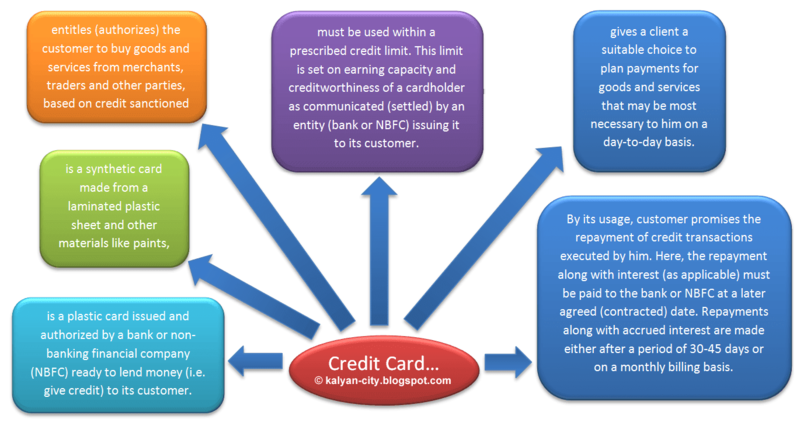 Credit-transaction limit is the highest limit set on credit transactions (of purchases) made through a credit card. Usually, cash's withdrawal limit is less than the credit transaction limit. 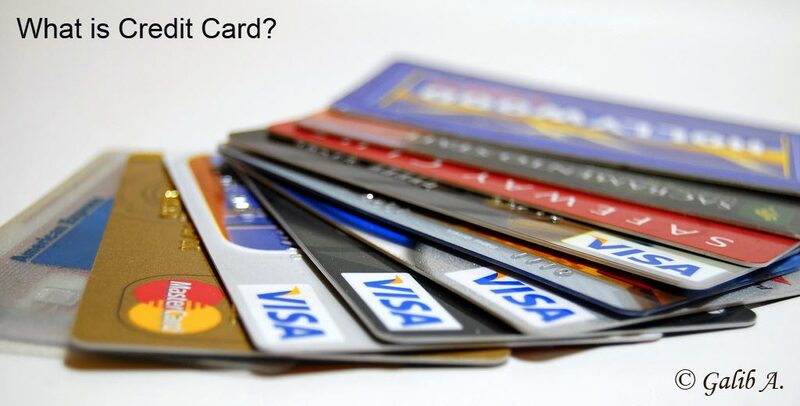 Credit card is a plastic card issued and authorized by a bank or NBFC ready to lend money (i.e. give credit) to its customer. Primarily, it is a synthetic card made from a laminated plastic sheet and other materials like paints, magnetic stripe, microchip (IC), gelatin, hologram, so on. It entitles (authorizes) the customer to buy goods and services from merchants, traders and other parties, based on credit sanctioned to him. Its usage should be within a prescribed credit limit. This limit is set on earning capacity and creditworthiness of a cardholder as communicated (settled) by an entity (bank or NBFC) issuing it to its customer. It gives a client a suitable choice to plan payments for goods and services that may be most necessary to him on a day-to-day basis. By its usage, customer promises the repayment of credit transactions executed by him. Here, the repayment along with interest (as applicable) must be paid to bank or NBFC at a later agreed (contracted) date. Repayments along with accrued interest are made either after a period of 30-45 days or on a monthly billing basis. It is hard to give a perfect definition of credit card. However, attempts can be made to define it under a general, financial, business or industrial perspective. Few selected statements given below will help you derive its narrow and broader meaning. 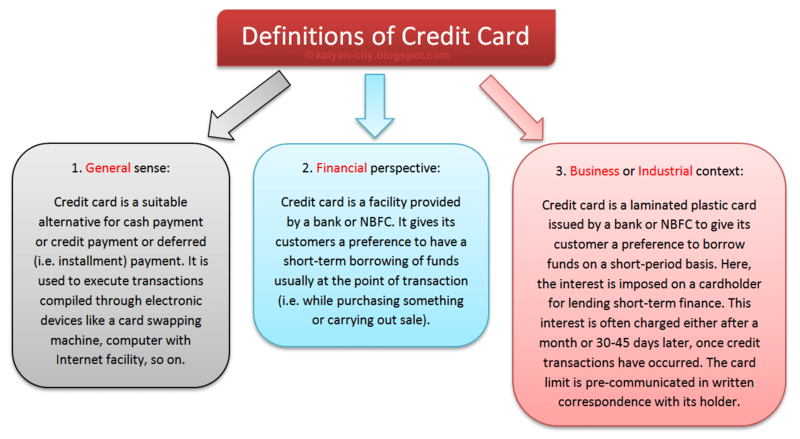 Here are three definitions of credit card depicted and listed below. Credit card has a height of 2.125 inches (i.e. 53.98 mm or 5.4 cm). It has a width of 3.370 inches (i.e. 85.60 mm or 8.5 cm). It has a thickness of about 0.030 inch (i.e. 0.76 mm or 0.076 cm). Its four corners (i.e. edges) are rounded or curved by a circle of radius (r) measuring 0.125 inch (i.e. 3.18 mm or 0.318 cm). 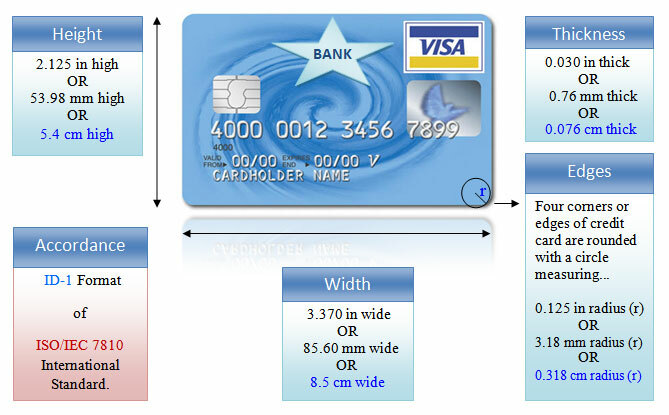 The above measurements are averages of the maximum and minimum values defined for credit cards using ID-1 format of ISO/IEC 7810. ISO/IEC 7810 is an international standard that specifies physical characteristics like size, thickness, etc. for identification cards. The identification cards used for banking purposes include ATM, credit, debit transactions, so on. These are helpful to carry out quick and smooth financial activities on a day-to-day basis. Though ID-1 format of ISO/IEC 7810 is an International standard, variations may rarely occur from country to country and even from one credit card issuing entity to another. The anatomy of credit card can be studied by analyzing its front and back side. 1. Sample image of the face or front side of a credit card. 2. Sample image of rear or back side of a credit card. Now let's discuss above details of credit card. Logo of an issuing entity (bank or NBFC) is a unique graphic mark. Logo is an emblem of the entity that issues a credit card in order to lend money to its customers. Its main purpose is to ease and aid instant public recognition of an issuer. It's a symbol that helps people identify the name of bank or NBFC that has issued a credit-card. A bank issues a credit card in collaboration with some payment processing company. To indicate this tie-up, bank on its issued cards also puts (mentions) a logo of its partnered card payment processor. Payment processor's logo helps a cardholder (user) to identify which payment processor will process and compile his credit card's transactions. It also helps him to choose an appropriate payment processor while shopping and filing payment forms. Hologram is a 3D image either of an object, individual or some particular symbol that has been projected and captured on a 2D flat surface. Hologram acts as a seal of originality. It helps to authenticate a genuine brand from a counterfeit one. It aids in distinguishing an original card from fake (dummy) cards. It acts as one of the security measures to avoid forgery. Card number is a long and unique number assigned to a credit card. Often, it is embossed (raised) on its face or the front-side. It is 16-digits in length and can be extended up to a maximum limit of 19-digits. First single-digit (from left) of a credit card number is a Major Industry Identifier (MII) digit value. It signifies the category or type of the entity that issued a card. Note: Click on above sample image of the front side of a credit card to get a zoomed preview and find out where exactly is MII digit value located. Refer following table to identify Major Industry Identifier (MII) digit values represents which category of an issuer. Image credits © Gaurav Akrani. Source © Wikipedia. The first set of four digits (which also includes MII digit value) of a credit card number is called Bank Identification Number (BIN). Printed in small fonts below the card number BIN is located on its front-left side. 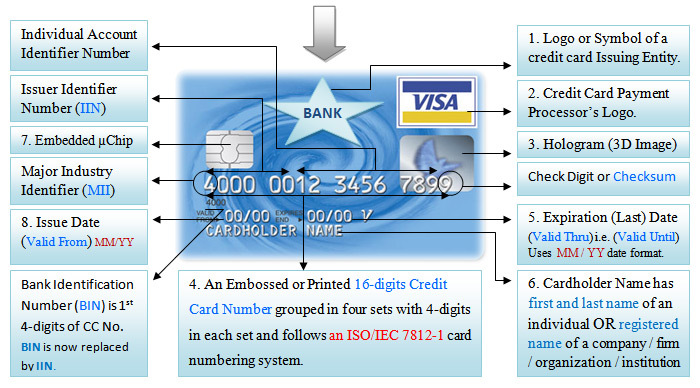 First six digits of a credit card number (including the single MII digit value) represent an Issuer Identifier Number (IIN) of a card issuing entity. It is required to operate in the global, inter-industry and intra-industry interchange. As per ISO/IEC 7812-1, BIN is now replaced by IIN. Following paragraph explains reasons behind it. With the rising demand and recognition of credit cards, the financial institutions opine the replacement of BIN with IIN. The purpose of such replacement was to cover wider areas of financial services, to bring various service providers under one roof and also to ease their identification. The IIN number consists of initial six digits when compared to BIN, which comprises of only first four. This incorporated change has resulted in more prompt and proper assistance to compile and to complete the card processing. Digits starting from seventh position up to the second last position (7 to (n-1)) makes an Individual Account Identifier (IAI). Here, n equals the total number of digits found in a credit card number. For example, if n=16, then the IAI number would start from 7 to (16-1) i.e. from seventh position to the fifteenth position. The IAI number is variable in length and can reach up to a maximum of 12-digits. Final (last or ending) single-digit of a credit card number is called a Check Digit or checksum. As per ISO/IEC 7812-1, the Checksum is a digit added to the end of a card number to help to verify (confirm) its accuracy and validate its authenticity (genuineness). Most card numbers encoded with Checksum digit use LUHN Formula based on LUHN Algorithm or MOD-10 method. Expiry Date of a credit card is the last day until which it remains valid. YY stands for a Year. For example, if 12/22 is on a credit card, then it is valid until 12th month of year 2022 i.e. its ‘VALID THRU’ date is December 2022. In other words, we can say that it will get expired and lose its validity on 1st January 2023. Cardholder name is a given string of embossed or printed alphabets on the front side of a credit card. It either mentions first and last name of an individual or specifies the registered name of a company, firm or an organization holding the account. To complete online transactions, it is mandatory that name on the card must match its cardholder's name. Embedded Microchip is on the front side of a credit card. It is an electronic storage device commonly known as a semiconductor memory. Details of a credit card issuing entity, so on. It provides a comprehensive security to prevent cloning or duplication of a credit card. It encrypts the sensitive data it stores. If hackers scan a credit card with some electronic spying device, then they will only fetch encrypted junk and not the original information that the chip contains. This encrypted scrap is almost useless to them as it is very difficult to decode and misuse it intentionally. It has a superior semiconductor memory and better processing capacity. It acts as a mandatory and essential security feature of a credit card. Issue date is the starting date from when a credit card becomes valid and gets ready to be used by a cardholder until its day of expiry. On card, words like VALID FROM are printed or embossed to mention its date of issue. As like an expiration date, issue date also uses an MM/YY date format. Example: If 01/15 is there on a credit card, then its validity starts from the 1st month of year 2015 i.e. its ‘valid from’ January 2015. In other words, we can say that the card became officially valid and got ready to being used on 1st January 2015. Magnetic stripe is often on the back side of a credit card. It comes in three different colors viz., black, brown, and silver. It is a storage device. 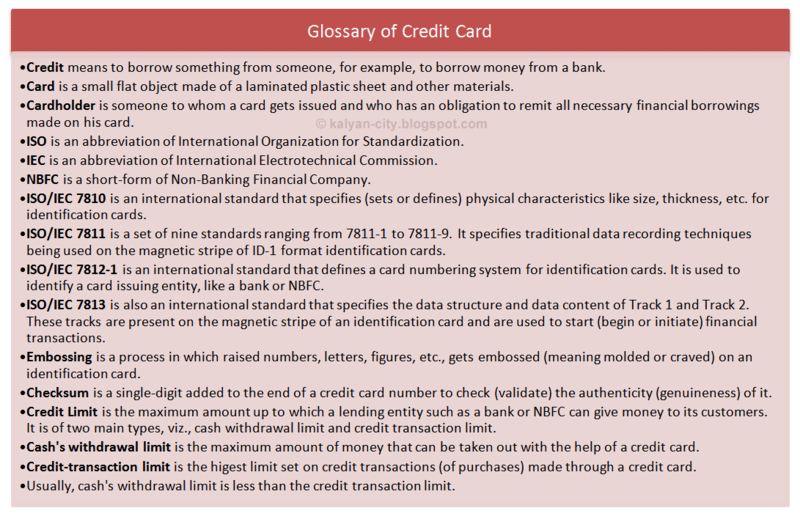 ISO/IEC 7811 is an international standard that specifies the traditional data recording techniques used on the magnetic stripe of identification cards like credit cards. On the Track No.3: It is again supposed to be 210 bpi or 8.27 bpmm. Track 1 mostly contains record of an alphabetical value that is always a credit cardholder's name and his related information. CID or 4DBC code of American Express (AMEX). Track 3 is either non-existent or empty or may consist of some supplementary information about the credit cardholder and hardly used for some validation process. Now with continuous improvement in the technology, magnetic stripes are getting obsolete as new contactless credit and debit cards are emerging in the market. Sometimes may even be a 4-digits number. Security code gives an additional layer of safety to the credit card. It helps to check and confirm the physical accessibility of the card. It prevents an unauthorized card access and minimizes online frauds. The card security code is being named and abbreviated differently by various card payments processing companies. Visa, MasterCard, American Express and JCB call it as CVV2, CVC2, CID, and CAV2, respectively. 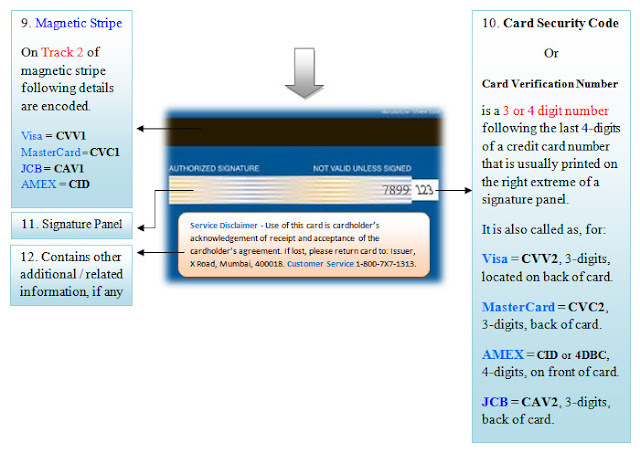 CVV2 is an abbreviation of Card Verification Value Two. CVC2 is a short-form of Card Validation Code Two. CID stands for a Card Identification Number. CAV2 can expand as Card Authentication Value Two. In the case of Visa, MasterCard, and JCB, card security code is a 3-digits number and is usually printed on the rear or back side of a credit card. However, in case of American Express, it is a 4-digits number printed on the face or front side of a credit card. Signature panel is a rectangular space located on the back side of a credit card. As its name says, it is a reserved place where a cardholder must put or write his authorized signature. It then must be signed by a cardholder with a good permanent marker pen. For this purpose, a pen with dark-colored ink preferably blue or black must be used. Signature panel is an added feature for customization and security of a credit card. It allows the merchants and traders to validate the authenticity of a person using a credit card. It helps them to cross check whether the physical signature in the transaction invoice matches with the one on the back of a card. Additional information is there on the back side of a credit card. Toll-free telephone number for a customer support. Service disclaimer acts like a legal acknowledgment (acceptance) for an agreement on the terms and conditions between a credit card issuing entity and the cardholder. Address of an issuing entity gives official mailing or contact information about the bank or NBFC that issued a card to its customer. If anyone is in possession of a lost and found credit card, then in such a case, this address helps a possessor to surrender the found card to its issuer. Contact the card issuer on various important matters arising on a day-to-day basis. Its really a great and informative post, its help all the new user, i have a card from Alliance Bankcard , they also tell me some tips. but if i read it before the card it help me lot. thanks.